John Anderson has been ruled out of the third ODI against Afghanistan on Thursday as he undertakes a return to play protocol after suffering a blow to the head while batting in Tuesday’s second ODI. Anderson scored 26 batting at three in his sixth ODI appearance for Ireland as Afghanistan beat their hosts by 39-runs to take a 1-0 lead in the series. 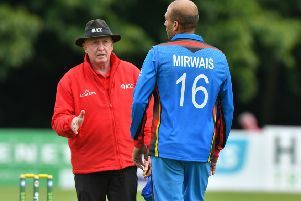 The Leinster Lightning captain was struck on the helmet by a Shapoor Zadran bouncer in the 30th over of the game, and has since shown symptoms of a concussion, meaning he will not be available for at least the third match in the series on today. Anderson will remain part of the squad in Belfast during his recovery. Play in the fourth ODI gets under way at Stormont at 10:45am.